Sourdough and I have been in an on-off relationship for years. We eye each other with distant reverence, each too polite to ask why our conversations never move from the store to the cozy confines of my kitchen. Like that hot guy you bump into, at the office coffee machine and you get so tongue tied that you can’t converse beyond the weather. Shame! It was only at a recent trip to Florence where I had my first and most intimate rendezvous with a certain bread. At the home of a lovely lady called Patrizia (read about my experience with social dining here) . Patrizia’s table boasted of gorgeous regional dishes prepared with a devotion only known to a woman in love with food. However, for me, the star of the show was the humble Focaccia Pugliese – a chewy bread with unmistakable sour notes, served as an appetizer that pairs beautifully with a glass of Prosecco and easy conversations. Since everything was homemade, Pat’s kitchen boasted of the aroma of fresh baking bread. Now that is a serious turn on, even for the most hardened of chefs (pun intended, if you may) what chance did I have to survive this close encounter? You’re probably wondering why am speaking of sourdough in a focaccia recipe. Aren’t they labelled as two different breads in our stores? Well, its time to remove your pretty heels and put on your engineer brother’s college hoodie, cause we’re about to talk science. So lets assume you have a basic functional knowledge of bread making. If not, click here for a 101. You probably also know that yeast is the leading hero of this show, and sometimes the director. Now yeast is not just what is available in packets in the supermarket, it effectively exists everywhere – on fruits, vegetables (which is what aids in making alcohol) it even exists in the air! This is natural or wild yeast, which our ancestors trapped to make bread and wines. So a sourdough is essentially a culture that captures and cultivates wild yeast through a mixture of flour and water stabilized over time. Its pretty simple – yeast is present in all flours. So when you let it sit for a couple of days, it eats up the sugars from the flour and gives out carbon dioxide and alcohol. You’ll notice bubbles in the culture, indicating that the yeast is multiplying and is pretty happy. Think Pacman, being grateful. Take care of it like your own. Feed it and water it, just like you’d feed you would to a child. Or a Puppy. Whichever floats you boat. Sourdough starter can be cultivated for months, even years, if kept properly. There is even talk of Italian mothers passing on century old starters to their daughters! Patrizia calls this the ceremony of preparation. Her starter is almost two years old and her secret is to loving it and giving it time to bloom. She calls hers Nicolina, “just like a puppy”. 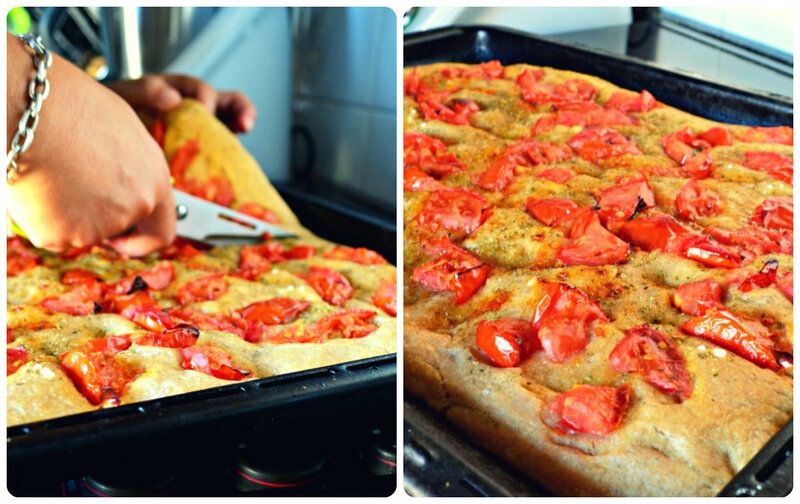 (with cherry tomatoes and oregano). *Liquid sourdough or sourdough culture is made using flour and water (equal parts) and ferments over a period of time to convert into an acidic and bubbly gloop like dough. To make a liquid version, you’ll need to refresh it once a month by adding more flour and water to the mix. Pat suggests keeping an apple near the culture to speed up the fermentation. You know its ready when it doubles in size in 3-4 hours. Add in the two flours, stirring with a fork for few minutes. Cover the dough with a clean tea towel and let it rest for about 15 minutes. Serve warm and enjoy your hard work with a good glass of Sangria!